Unlike many dog food brands, Gilbertson and Page have been making Gilpa Dog Food for over 130 years, gaining a reputation as a supplier of high quality complete dog food, but at an affordable price. Within the range of gilpa dog food varieties you will find a food suitable not just for working dogs, but also pet owners too, with lifestage recipes to suit your dog's individual requirements, activity level or age! Each Gilpa or Dr John dog food is formulated to provide your puppy or dog with the correct level of essential vitamins minerals, protein and carbohydrates to keep them healthy and active, with Vat Free recipes available for working and sporting dogs, including those dogs that require a maintenance dog food suitable for them when resting or in closed shooting season. 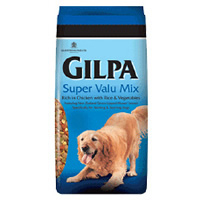 Gilpa valumix: 5 stars out of 5 based on 3 user reviews. 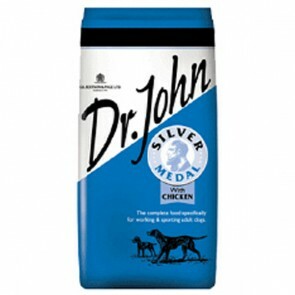 This will keep my dog going for a long time and she loves this all round dry food. Brilliant! At last I have found a company who sells this first rate product :-))) Tansy, the Springer Spaniel, "adopted" us from a poor home and arrived with a box of "food" that was multi-coloured?! Having spoken at length with feed suppliers and vet's etc we decided Gilpa Kennel was the best choice and we have never looked back. Tansy is bright eyed, fit as a flea and is very active... and now 7yrs and continues to thrive. Gilpa is a excellent product, top quality nutrition with the bonus of being vegetarian and therefore totally digestible..we do very little poop scooping as a result! I would reccomend this to anyone for their dog, whatever breed and we will certainly continue to buy!! PS: Valupets deserve praise too, I ordered two separate sacks of Gilpa on separate days...and someone had the foresight to pack them together in one box - full marks for that, well done guy's, we are very happy customers! I have breeding and showing Rough Collies for 22 years and for the last 5 years have been feeding Silver Medal. My dogs always look in good condition and never suffer from digestive problems that Rough Collies are prone to.